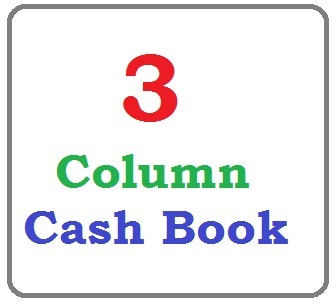 Define and explain a three column cash book/treble column cash book. Prepare a three column cash book. What is the difference between a single column cash book, a double column cash book and a three column cash book? A three column cash book or treble column cash book is one in which there are three columns on each side – debit and credit side. One is used to record cash transactions, the second is used to record bank transactions and third is used to record discount received and paid. Put the opening balance (if any) on cash in hand and cash at bank on the debit side in the cash book and bank columns. If the opening balance is credit balance (overdraft) then it will be put in the credit side of the cash book in the bank column. If a cheque is received from any person and is paid into the bank on the same date it will appear on the debit side of the cash book as “To a Person”. The amount will be shown in the bank column. If the cheque received is not deposited into the bank on the same date then the amount will appear in the cash column. Cash received will be recorded in the usual manner in the cash column. When we make payment by cheque, this will appear on the credit side “By a person” and the amount in the bank column. If the payment is made in cash it will be recorded in usual manner in the cash column. If an amount is entered on the debit side of the cash book, and the exact amount is again entered on the credit side of the same account, it is called “contra entry”. Similarly an amount entered on the credit side of an account also may have a contra entry on the debit side of the same account. Cheque/Check is drawn for office use: It is payment by bank and receipt in cash. Therefore, enter on the debit side, cash column “To Bank” and on credit side, bank column “By Cash”. Bank charges appear on the credit side, bank column “Bank Charges.” Bank interest allowed appear on the debit side, bank column “To Interest”. The opening balance of cash in hand and cash at bank are not posted. Contra Entries marked with “C” are not posted. All other items on the debit side will be posted to the credit of respective accounts in the ledger and all other items on the credit side will be posted to the debit of the respective accounts. As regards discounts the total of the discount allowed will be posted to the debit of the discount account in the ledger and total of the discount received to the credit side of the discount account. On January 1, 1991 Noorani Stores cash book showed debit balance of cash $1,550 and bank $13,575. During the month of January following business was transacted. ” 8 Deposited into bank the cheque received from A. Hussan. ” 10 Received from Hayat Khan a cheque for $775 in full settlement of his account and allowed him discount $15. ” 12 Sold merchandise to Divan Bros. for $1,500 who paid by cheque which was deposited in the bank. ” 31 Deposited into bank the cheque of Hayat Khan. ” 31 Drew from bank for office use $250. You are required to enter the above transactions in three column cash book and balance it. so good of you. The site is soo helpful. Trust me from this site am able to tackle different queries. Be blessed. Very nice it’s simple type of example. but we need more brief. then it’s very helpfully for students. GOOD FOR MIDDLE LEVEL ACCOUNTANTS WORKING IN BIG COLLEGES/INSTITUTIONS. Thank for your information about contacting entry.. It’s easy for me now.. I m a commerce students and really found your website helpful..